The Napa Valley Bench supports a classic, inviting look for your dining area with its rounded pedestal supports and slim bridge. Why consider a bench for your dining table? 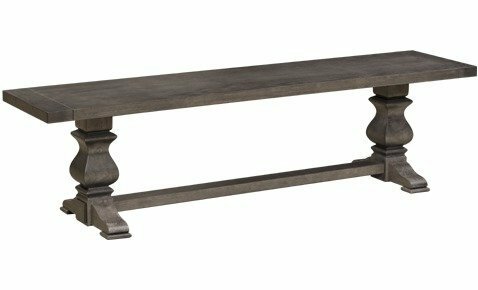 Available in either 68" or 80" long, this piece works perfectly with both our Napa Valley Solid Top Dining Table or our Napa Valley Extension Dining Table. The 68" bench was designed to complement either table in 72" long, and the 80" bench fits comfortably under either table 84" long. With any questions about crafting your home's perfect Napa Valley set, please give us a call at 1-866-272-6773 or visit our local store in Sarasota, Florida. Custom sizes are available. Please call us for more information and a quote.